Important 2018: This site no longer accepts USA players. We recommend Downtown Bingo, a trusted legal online bingo site that accepts all USA players. Miami's beautiful South Beach was once home to the infamous pirate Blackbeard, and there are so many sunken ships nearby that the area has become known as the wreck diving capital of the world. But you do not have to travel to the gorgeous South Beach, which the Travel Channel has rated the #1 beach in the United States, to find your own treasure. Simply fire up your PC and head over to South Beach Bingo. South Beach bingo is a socially driven bingo hall that allows you to chat with other players from around the world, South Beach Bingo provides legally licensed Internet bingo and slots for US and international players for as little as one penny (slots) or $0.25 (bingo). 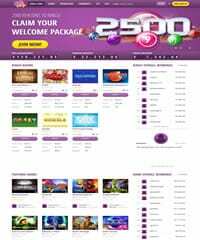 The colorfully designed and simply laid out site also offers monthly bingo contests and promotions, video poker, keno and pull tabs, and a generous welcome bonus package. Site software is dependable and certified, and you can even get started for free with a $25 no deposit welcome bonus and 500% free on your first deposit. Let's head over to South Beach Bingo for an in-depth review to gain insight into what a legal online bingo experience has to offer. South Beach is a bingo site that has been in business since 1998 and has an excellent track record for being fair and trustworthy and offering fast payouts. New players can take advantage of their $25 free no deposit chip and also their amazing 2500% promotion where they award you with a 500% bonus on each of your first 5 deposits. That's a lot of free bonus money and should give any player months of action with the shot at hitting a jackpot. Is South Beach Bingo Legitimate? Yes. No site can hold up for over a decade unless they are trustworthy and pay out winners accordingly. South Beach has an excellent history in the industry and are known to be reputable. Parlay Games online gaming software is well known in the Internet bingo industry. The fresh and fun interface provided by this reliable software is also home to powerful data encryption technology to protect your personal and financial information. This software makes the site extremely easy to navigate, and works in your computer's or smartphone's browser so you do not have to download any software. Parlay Games is known as one of the leading bingo software providers in the world, frequently tested and approved by both UK and North American gaming industry experts. Games are audited several times a year by an independent third party. A random card distributing piece of software much like an online casino's Random Number Generator (RNG) ensures an absolutely random distribution of available virtual bingo cards. Licensing and certification - Is South Beach Bingo Legal In The US? By obtaining legal licensing in Curacao to offer online gambling, South Beach Bingo can deliver real money Internet bingo access to Americans, as well as players from around the world. The Curacao eGaming commission is one of the oldest regulated online gambling license providers, coming from a politically stable jurisdiction. Bonuses is where South Beach bingo site truly shines. In addition to offering some of the best ongoing promotions in the entire industry, they also offer some of the best deposit bonuses. For example, new players can take advantage of their incredible 2500% promotion where they award you with a massive 500% bonus on each of your first 5 deposits to the site. That will give you a great chance at hitting a jackpot or coverall on their dime. Each day of the week a special daily promo is offered, as well as a deposit promotion. For instance, on Monday you may receive a generous 250% bonus on your deposit, or 400% if you deposit more than $100. There are also Chat Specials, which reward you with free play when you join a particular chat-enhanced bingo room. Special Morning Rally promotions offer a $100 bonus, and Candlelight Delight delivers midnight specialty games and bonus awards, coveralls and dancing games. Join the Desperate Housewives room for fixed prize games up to $150, deposit on High Roller Wednesday for special matching bonuses, or head over to the Dollar Room for $500 fixed prizes every Tuesday from noon to 1 PM Eastern Standard Time. Friday delivers a $1,000 cash prize, and new account holders benefit from a Cash Back Bonus which replaces lost money, as well as a free $25 welcome bonus and a total of 1,100% bonuses spread across your first three deposits. A special VIP Program automatically enrolls you after you play your first bingo game, and you earn stars and Bingo Bucks (BB) based on your activity. You can then cash in your VFP stars and BB for game play. Also, since South Beach Bingo is a socially driven website, you receive a 20% comp bonus whenever you refer a friend or family member. There are literally dozens of promotions and bonuses offered at any one time, and a trip to the website is the best way to keep updated. If you would like to compare the bonus offers of multiple bingo sites, just visit our page that lists all of our online bingo reviews, where you'll find a great 'comparison at a glance' view that lists the bonuses of each brand we recommend. South Beach Bingo offers 75-ball bingo games, and you can also enjoy Keno, Video Poker, Pull Tabs and Slots. Ticket prices for bingo run anywhere from $0.25 to $1, with progressive jackpots sometimes reaching several thousand dollars. A recent trip to the Dollar Room saw four players playing for a progressive jackpot of more than $15,000. There are seven different bingo rooms which offer progressive jackpots and either fixed starting prizes, or starting prizes which grow with the number of participants. The site also offers a free practice bingo room and games where you can get a feel for the user interface for free. A special $1,000 Cover All game is also available. Every bingo game supports playing up to 48 cards at once. Both 1 line and 5 line slots are offered, and video poker game options includes Jacks or Better, Double Joker, Deuces Wild, Joker Poker and several other variations. You can also pre-purchase cards so you never miss a game, and the South Beach Bingo interface automatically marks your card for you. All of the popular bingo games are offered, including cover all, stop sign and many more. The company's special financial software delivers your credit card information to a virtual terminal. That Gateway receives your personal and financial data via an SSL encrypted channel that guarantees 100% privacy. Learn more about South Beach Bingo banking below. Support is provided for US players through legal Curacao licensing, but some US-based financial institutions do not honor credit card transactions for online gambling. Because of this, South Beach Bingo provides Visa, AMEX and MasterCard funding options, but also offers EcoCard, Click2Pay, NETeller, Instadebit, MoneyBookers (Skrill), and Cash Transfers for depositing to your account. Not all of these options are available in all countries. When you open an account, you will receive $25 in free money to get started, and you can click on the Cashier tab to see what banking options are available in your area. Is Southbeach Bingo Mobile Friendly? With dozens of bonuses and promotions offered every week, South Beach Bingo makes sure you have an opportunity to benefit no matter when you play. Bingo, video poker, keno, pull tabs and slots are available on-site, and there are a wide variety of deposit and withdrawal options which are dependent upon your particular location. Special chat-enabled bingo rooms deliver the same kind of social atmosphere you get in a physical bingo Hall, progressive bingo games can deliver jackpots that reach thousands of dollars, and the site software is fast, reliable and enjoyable. Also, legitimate licensing in the industry-recognized Curacao jurisdiction means the company is legally licensed to provide Internet gambling options. That means support for US as well as international players, and South Beach Bingo has been around since 1998. For many reasons, it is easy to recommend the South Beach Bingo virtual bingo hall for bingo lovers from around the world.